August 2018. Function and homeostasis of the brain relies on communication between the complex network of cells, which compose this organ. Consequently, development of the different groups of cells in the brain needs to be coordinated in time and space. The group of Amparo Acker-Palmer (Buchmann Institute of Molecular Life Sciences and the Institute of Cell Biology and Neuroscience, Goethe University) reported in a research article in the latest issue of the journal Science a novel function of blood vessels in orchestrating the proper development of neuronal cellular networks in the brain. It is known that vascularization of the brain is necessary to provide neurons and glial cells with oxygen and nutrients important for the metabolic support of neuronal networks. “For several years, we knew that the vascular and nervous systems used very similar vocabulary to develop and function and therefore we postulated that such a common vocabulary could be used to ensure that both systems co-developed in synchroneity and communicated with each other for proper brain function”, explained Acker-Palmer. To study the communication of the blood vessels and neuronal cells the Acker-Palmer group focused on different aspects of neurovascular development. First, they used the vascularization of the mouse retina as a well-established method to investigate molecules important for vascular growth. Using this method, they discovered that a molecule, Reelin, that had been previously shown to influence neuronal migration was also able to independently influence the growth of vessels using a very similar signaling mechanism by activating the ApoER2 receptor and the Dab1 protein expressed in endothelial cells. A very important structure in the brain is the cerebral cortex, which plays a key role in all basic functions such as memory, attention, perception, language and consciousness. Neuronal cells in the cerebral cortex are organized in layers and this organization is established during embryonic development. “We decided to eliminate exclusively the Reelin signaling cascade from the endothelial cells and see how this influenced the arrangement of neurons and glial cells in the cerebral cortex”, said Acker-Palmer. Using this system, the scientists revealed the astonishing finding that endothelial cells instruct neurons as to their correct positioning in the cerebral cortex. Mechanistically, they could show that endothelial cells secrete laminins that are deposited in the extracellular matrix surrounding the vessels to anchor properly the glial cell fibers that are necessary for proper neuronal migration and for the proper development of the cerebral cortex. In the mature brain, glial cells also wrap around the blood capillaries and prevent harmful substances from the blood stream from entering the brain. This is known as the “blood brain barrier” and it is an essential structure that develops in the brain to keep homeostasis. Importantly, Acker-Palmer and her team also showed that the same signaling cascades used by endothelial cells in the cerebral cortex to orchestrate neuronal migration are used to establish communication at the blood brain barrier. “Several neuropsychiatric and neurodegenerative disorders have been associated with abnormal neurovascular communication. Therefore, understanding the signaling pathways and mechanisms involved in such communication is fundamental to finding new approaches for treating dementia and mental illness”. Amparo Acker-Palmer, Institute of Cellular Biology and Neuroscience, Buchmann Institute of Molecular Life Sciences, Riedberg Campus, Goethe University Frankfurt, Frankfurt/Main, Germany, Tel. : +49 (0)69 798-42563, Acker-Palmer@bio.uni-frankfurt.de. 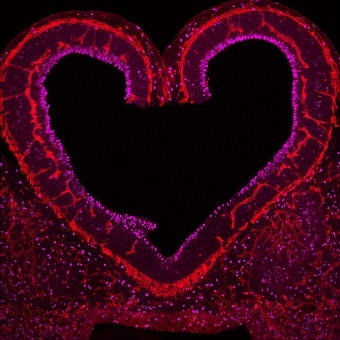 Picture: Blood vessels in red in close communication with proliferating neuronal cells in the mouse cortex at embryonic day 10 (Photo: Cecilia Llao-Cid).